One of those "long but worth it" waits. Glad to hear it's a good buy. I was intending to order a copy myself, but as much as I love Peterson, was a little turned off a bit by the cost. I'll take your word for it, Ash. I may reconsider. Anthony, it's $60 for a coffee table book of a specific type. Cost is a relative deal. Hell, the book is even properly drilled. But does it have the old or the new bowl coating? You guys have it sweet ... smokingpipes.eu doesn't carry it. Can you not order it from smokingpipes.com? We most definitely will be carrying it. We're still waiting for our copies to arrive, but we've got everything ready, so we'll put them up the day they come in. anthonyrosenthal74 I am not sure ... it may work since it's not a tobacco product, although some friends in Bucharest ordered several of those bamboo tampers, and they had some issue at customs. I am not sure how that ended, but I must check. My expectations are pretty high, and I'm confident they'll be exceeded. I'll pick up my copy at the show in a few weeks. 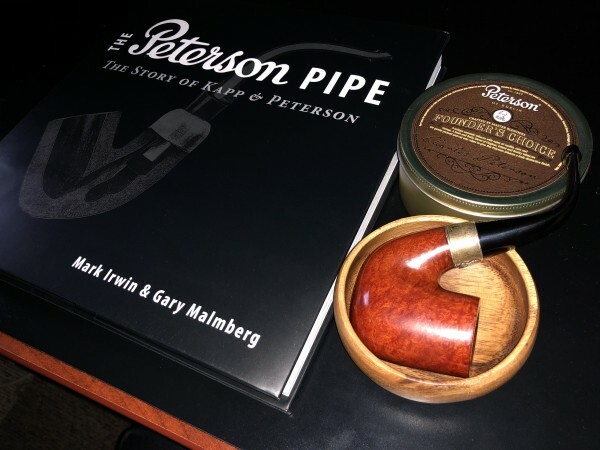 I've got a copy due to arrive tomorrow from SP, along with a couple other pipe books I've been meaning to add. Hopefully...I'm sure they will...get the new Tom Eltang book in soon. Tom posted pics of a few pages on Instagram and there were some cool churchwarden/cavalier sitters in one of the pics, a shape I never had seen before by him. Well, there goes my evening. This is a very pretty book. I skimmed through and saw the great pictures and oh my, oh my! I'm planning to buy mine in Chicago and get Mark Irwin to sign it. He's a great fellow who's always eager to answer any Peterson questions I've sent his way. At least one of my Petes is in the book, so I've GOT to buy one! Which Pete is yours, craiginthecorn? Mine is the 337S. A small, gold-banded Dutch billiard with crazy birdseye and a beautiful contrast stain. There may also be a couple much lower grade Laxiom pipes. I'm not certain those made the final cut. They aren't special apart from the feature which made stems easily replaceable. Should I post a spoiler or do you want to wait?